The Conversations report gives you aggregate data of all interactions that happened through Conversations. You can use this report to see the originating URL of conversations, number of contacts acquired, average response times and most popular device types used by visitors. The Conversations report will load and display all URLs that conversations originated from, along with their overall metrics. Setting a date range will allow you to view the report data within a specific time period. 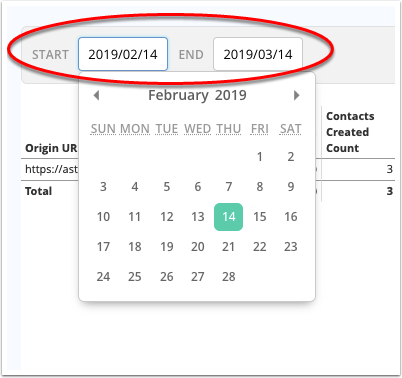 To set a date range, click on either the start date field or the end date field. Then, click the calendar to select a date. Note that the "End" date field will display data up until the date selected. In addition, you can click table column headers to sort data in ascending or descending order. Whitelisted URL where the visitor initiated a chat from. Number of conversations threads from the originating URL. Number of new contacts created from conversations. This includes contacts created who submitted their email address to the Email Capture Form in the chat widget and contacts created when they sent an email to your unified inbox. Rate at which site visitors become contacts in your ActiveCampaign account. Total number of messages sent to the unified inbox from visitors and contacts. Total number of messages sent from Agents. Average number of messages sent and received for each conversation. Average amount of minutes between when the visitor submitted a chat and when an Agent provided the initial response. This indicates how long a visitor waits before they receive a reply. The device used most by visitors/contacts when they submitted a message to your unified inbox. This can display either desktop or mobile. At the top right of the report is an icon containing three dots. When you click this icon, a "Download Data" option will appear. Click this option to download the Conversations report data to a CSV, TXT, Excel (2007 or later), JSON, HTML or Markdown file.